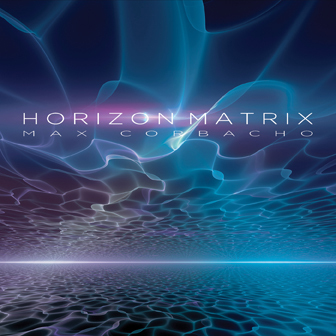 I’ve been following Max Corbacho since discovering his debut “Vestiges” in 1999. It opened a world of passionate ambient sonic splendour unravelling until this very day. A highly atmospheric, enchanting, vibrant and expansive ambient-space is found on the five tracks making up the 73-minute “Horizon Matrix”, an alternate aural dimension even tapping into the infinite occasionally. While composing grand opener “Quantum Cathedrals” Max even realized he was re-entering the same sacred, far away spaces of his 2009 recording “Ars Lucis”. The full recording is an imminent, vast canvas of fluid patterns, ethereal soundscapes and profound liquid textures interacting and melting seamlessly while releasing its imaginative yet delicate sonic perfume through its leaves. Here, immersion comes naturally as the listener is surrounded by the continuous ebb/flow and gentle shifts of rich, harmonious pads caressing the heart and mind. However, great dynamics and intensity surface on the stellar “Into the Ocean of Time” without abandoning the ethereal thread.